Finding affiliates can be a pain. Many companies rely upon businesses contacting them with interest in their affiliate program. While this method produces many fine affiliates, there are much more proactive ways for a brand manager or marketing manager to find potential partners. If you are stuck in the beginning phases of your affiliate marketing program, using your web analytics package might be the ticket to gathering all the “low-hanging-affiliate-fruit”. Assuming you have a website that represents your business (brick-n-mortar, or web-based, it doesn’t matter) as well as a web analytics package, keep reading. What Should I Look For In The Referral Report? 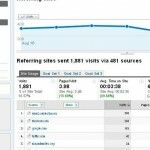 The referral report shows links and traffic to my site from other websites. It doesn’t show traffic from search engines, or emails; those are in different reports. If someone linked to your site on their site (and someone clicked that link) you’ll see that here. You can also see the different statistics comparing the quantity and quality of different sources. Click on the “ecommerce” tab if you are an ecommerce site to see which sites are bringing you traffic that results in sales. If you aren’t ecommerce, your tab will read “goals”. That may help you select potential affiliates. An Affiliate is someone that drives traffic to your site in exchange for a percentage of sales or a set amount per lead. These sites on this report are already doing that! 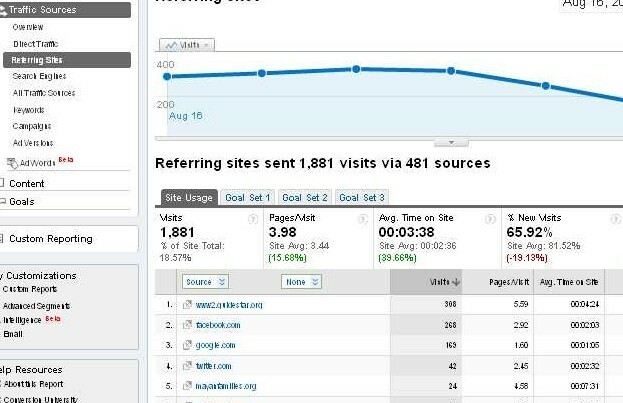 You can see which sites are bringing traffic and sales. If they are bringing you 5 sales a day without trying, imagine how many sales they could bring if you offered them an incentive. There are other benefits to using this report to help you find affiliates: if someone takes the time to link to your site, they are already aware of your brand. That will make contacting them, and “selling” your product easier. The fact that they have a link to your site also indicates that they thought their customers might be interested in your site. They are already sold. It might not seem like there will be many links left. That will depend on the size of your site and how long it has been active. At the very least this will give you an idea how to approach improving your affiliate program.